The world is struggling to deal with energy guzzling air conditioning and the environmental havoc it has unleashed on Earth’s climate. Behind this problem are modern architects and their revolutionary glass and concrete designs which make air conditioning a necessity. But Charles Correa stood out in the crowd. 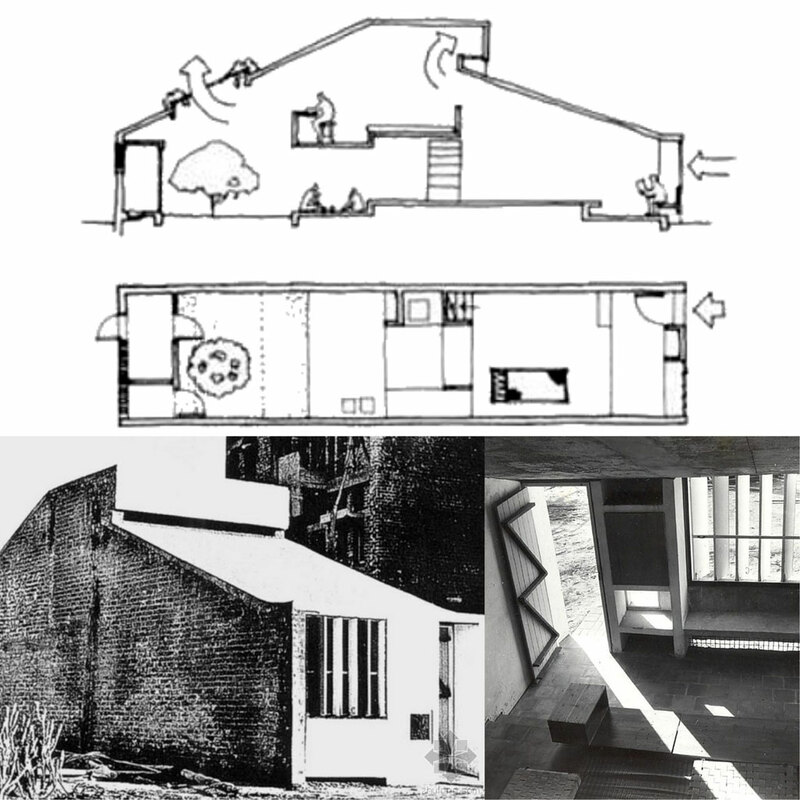 He reminded us that buildings and architects need to work with the elements. Correa spent more than half a century designing buildings that did not have to depend on air conditioning and heating. He once said “form follows climate” and gave an environmental twist to the popular architectural dictum “form follows function”. A prototype for low-income housing, this building was shaped such that cool air was naturally drawn through it, leaving via a vent close to the roof. The design enabled the modulation of temperatures through convection currents. As the heated air rose, it moved along the sloping surface of the ceiling and slipped out through the vent, thus drawing in new air from the lower level to replace it. Inside the units, there were almost no doors; privacy was created by the various levels themselves, and security was provided by the pergola-grid over the internal courtyard. In designing the pavilion, Correa furthered the natural cooling principle developed in the Tube House. Kanchanjunga is a condominium of 32 luxury apartments of four different types in southern Mumbai. 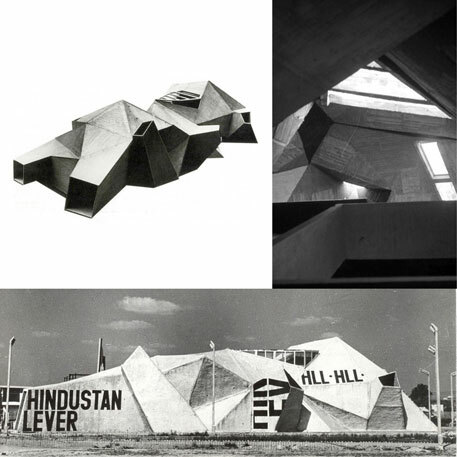 It is celebrated as a pioneering exercise in bio-climatic design. In Mumbai, a building has to be oriented east-west to catch the prevailing sea breeze. But this direction also brings in hot sunshine and heavy monsoon rains. Old bungalows in Mumbai solved these problems by wrapping a protective layer of verandahs around the main living areas, thus providing the occupants with two lines of defence against the elements. 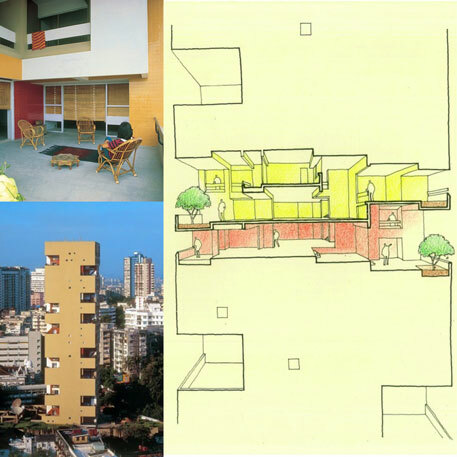 At Kanchanjunga, Correa successfully applied these principles of climatic responsible design to a high rise building. The National Crafts Museum was an exercise in architectural and cultural metaphors with a series of courtyards forming the central circulation spine. 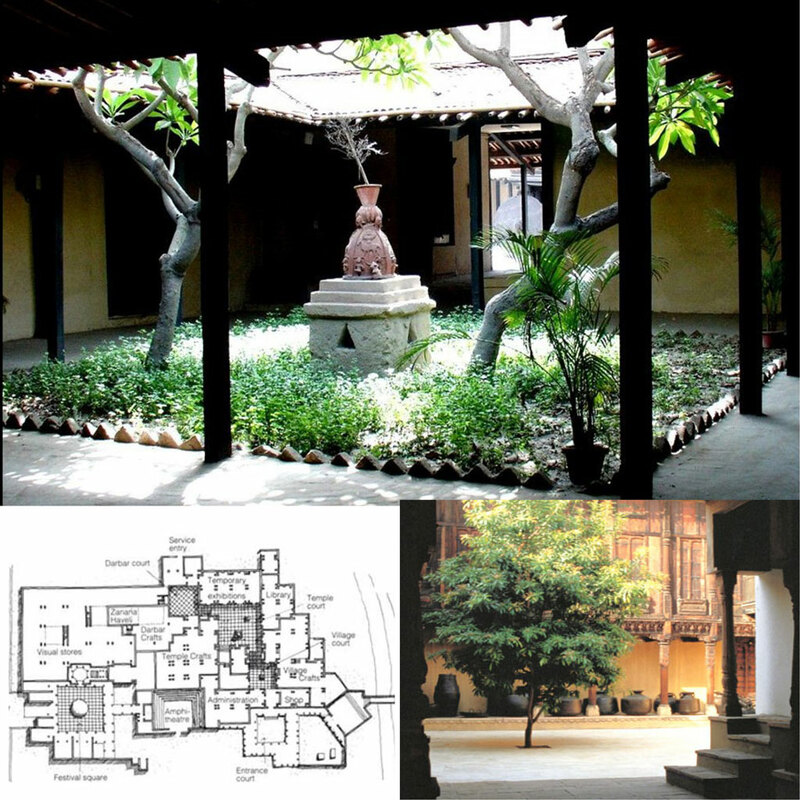 Correa’s design also demonstrated the relevance of courtyards as an effective means of regulating comfort conditions in an urban setup. The museum is important as it provided space to artisans from around the country to assemble and share their craft with counterparts from different regions. This transformed the project from a mere exhibit to a cultural exchange and craft promotion arena. This idea was later fully realised by others in a project like Delhi Haat. The ashram was designed using local materials. It has tiled roofs, brick walls, stone floors and wooden doors. But there are no glass windows anywhere in the building. Light and ventilation is provided by operable wooden louvres. Correa limited the use of concrete to structural beams which doubled up as rainfall conduits. 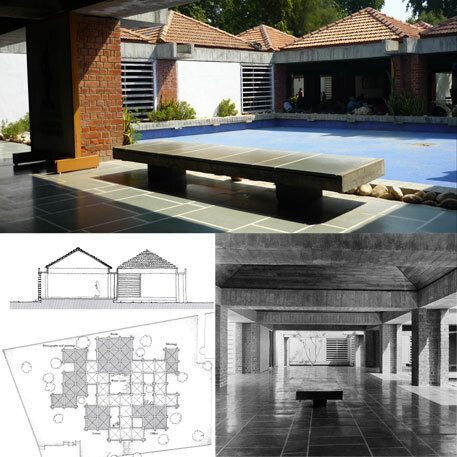 The open air exhibition space capitalised on local climatic conditions and modulated comfort requirements with courtyards and water bodies strategically placed in the building layout. Cross-ventilation is essential in the hot and humid climate of southern India. Traditionally, buildings in Kerala were built in pyramidal form with the plinth rising parallel to the slope of the tiled roof above. This minimised the need for enclosing walls to keep out the sun and rain. From within the pavilion, one's line of vision is deflected sharply downwards to the grass, which is refreshing and blissfully therapeutic on a hot day. 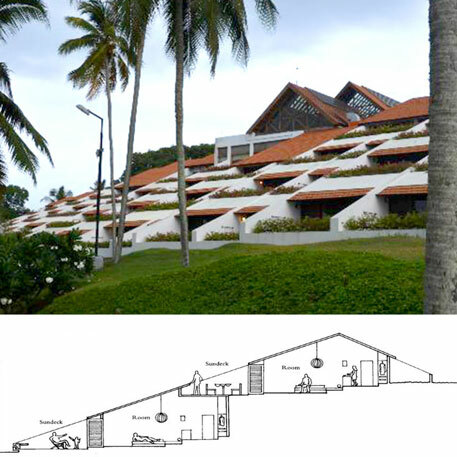 Correa incorporated this local wisdom of natural ventilation in the Kovalam Beach Resort. Additionally, in order to preserve the natural beauty of the site, the facilities are all built into the hill slopes. The construction is entirely in the traditional style of Kerala—white plastered walls with red tiled roofs. Other pavilions consist of light bamboo chhatris with coir matting on the floor and local Kerala handicrafts. According to Correa’s official website, this project demonstrated how high densities (500 persons per hectare, including open spaces, schools and other facilities) can be easily achieved within the context of a low-rise typology. The site plan is generated by a hierarchy of community spaces, starting with a small shared courtyard 8 m x 8 m around which seven houses are grouped. 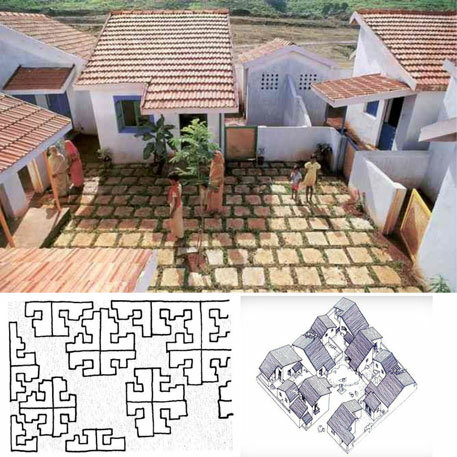 Each of these houses is on its own piece of land, so that the families can have the advantage of open-to-sky spaces. The form and plans of these houses are simple and, hence, the houses can be built and extended by traditional masons and craftspersons. This would generate employment in the bazaar sector of the urban economy where they are needed for the new urban migrants. Correa planned the New Bombay (Navi Mumbai) as a “Bazaar” city with all elements that are now considered as constituents of new sustainable urbanisation. The project sought to address the crucial issues of affordability and equity, with emphasis on mass transport, coherent urban form and housing patterns which use space as a resource. Similarly, Correa tried addressing equity in road space in 1968 by recommending to the Bombay Municipal Corporation an experimental modification in one of the city's principal streets (Dadabhai Naoroji Road) in order to deal with both hawkers during the day and the homeless at night. 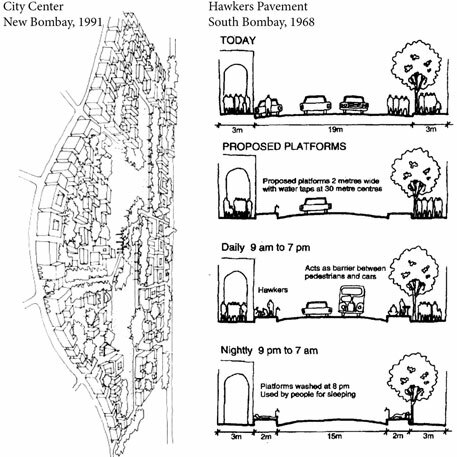 He proposed a line of platforms with water taps placed at intervals of 30 m. During the day, these platforms would be used by hawkers, thus clearing the pavements and arcades for pedestrians. 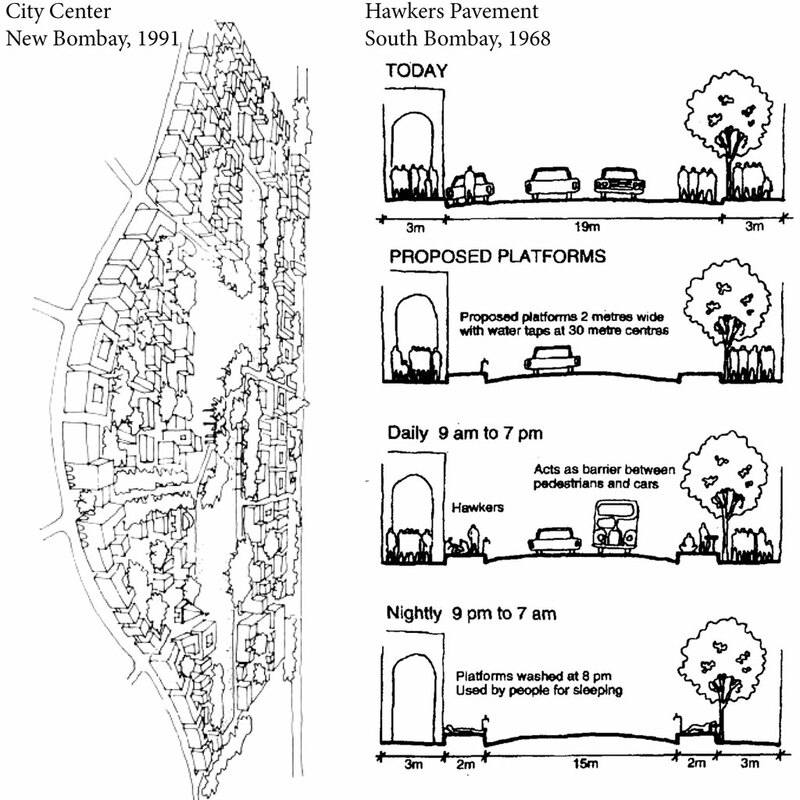 The platform was also to act as a safety barrier between pedestrians and vehicular traffic. Both projects were never realised according to Correa’s vision.